From Klio polska to "Klio Polska"
In the preface to the 2004 edition of Klio polska. Studia i materiały z dziejów historiografii polskiej po II wojnie światowej (Polish Clio. Studies and materials on the history of Polish historiography after WWII), published under the aegis of the Tadeusz Manteuffel Institute of History of the Polish Academy of Sciences, one can read the following remarks: “Initially this collection was intended as a continuation of the two volume anthology Historians on History (1963, 1966) edited by Marian Henryk Serejski. The latter presents the most representative theoretical and methodological views held by Polish historians from the late eighteenth century to the inter-war period. Given the fact that the construction of Historians on History had not become outdated, supplementing this two volume work with the period of the fifty years which followed the outbreak of the Second World War, thus covering the era of the Polish People’s Republic, seemed as obvious a task as it did easy to carry out. However, our initial optimism quickly began to wane. It turned out that because of some copyright issues we were restricted in the selection of material to be included in a new volume. For this reason we had to drop the idea of publishing a continuation of the collection of sources mentioned above. However, we had no doubt that it was necessary to continue scholarly research into the most recent history of Polish historiography. This is how the idea of Klio polska – a collection of studies on the history of historiography was born. The main emphasis here is on the past fifty years. However, this does not mean a complete exclusion of papers on earlier history, including not only the inter-war period but also the nineteenth century. It would simply be difficult to understand the Polish historiography of today without any reference to some specific issues that came to the fore after 1795, that is, after the year which opened to the Poles the era of stateless existence”. Such was the birth of Klio polska. Its life did not come to an end with the publication of one volume, for the Institute of History of PAN found it advisable to continue it as a new series and in the following few years there appeared in print five further volumes, marked with the numbers from 2 to 6, while the first volume is, in bibliographical terms, left with no number. With time, titles borne by successive volumes were slightly altered. The changes to the titles of particular volumes concerned only the period of time each of them covered. The first four volumes were devoted to Polish historiography after the Second World War, while the last two also covered Polish historiography in the nineteenth century. However, the essential part of the title: Klio polska. Studia i materiały z dziejów historiografii polskiej (Polish Clio. Studies and materials on the history of Polish historiography) remained unchanged and so did the graphic design of particular volumes which differed from each other only in the colour of their paperback covers. The exception is volume 3 which, having been awarded a prize in a competition organized by the Institute of National Remembrance “Memory and Justice”, distinguishes itself from the remaining volumes by its hardcover. The idea of presenting studies on the history of Polish historiography entered a new stage following the decision taken by the Director of the Institute of History of the Polish Academy of Sciences at the end of 2014 to transform the series into a scholarly yearbook published on the Internet. In its new form, Klio Polska is designed to cover the whole of the history of Polish historiography, thus including that of the pre-partitioned era – of which we wish to inform all the authors interested in having their papers published in our journal. The change in the formula of the publication is reflected in its title. Removed from it is the part which indicated the chronological range of studies included in previous volumes. In addition, the title is written in capital letters, which is proper to scholarly journals. 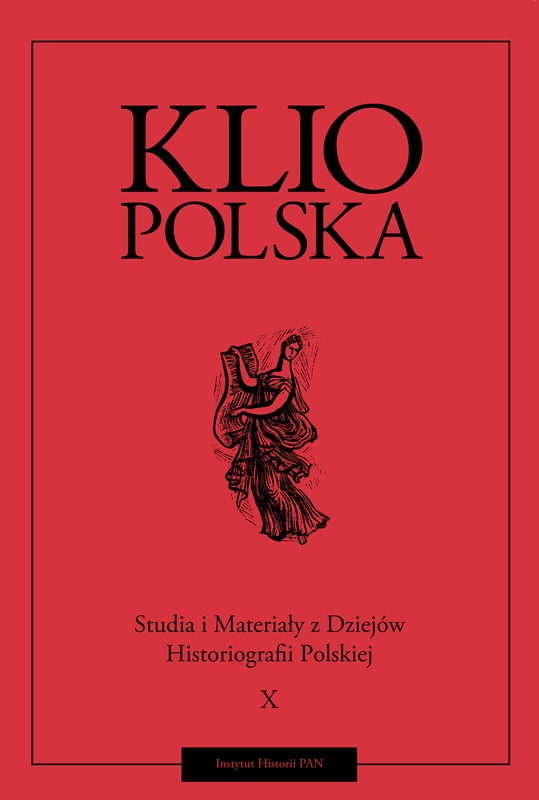 Now the title of the journal sounds as follows: Klio Polska Studia I Materiały z Dziejów Historiografii Polskiej (Polish Klio. Studies and Materials on the History of Polish Historiography). In assuming the form of a scholarly journal, Klio Polska had to be supplemented with a new section, “Reviews and Reports”. However, regardless of these formal and structural changes, the areas of research to be dealt with in the journal remain the same. The first of them concerns the relationship between Polish and non-Polish historical thought, including in particular European historical thought, the second – the analysis of theoretical, methodological and political views underlying the development of Polish historiography, the third – the history of institutions that formed the infrastructure of Polish historical sciences, the fourth – the analysis of works written by distinguished representatives of Polish Clio and the fifth – attempts to adopt an interdisciplinary approach to historiographical investigations or to apply typically historiographical approach to studies that lie outside the field of the history of historiography such as, for example, business history or what is known as “organizational history”. Of course one is permitted to cross the borderlines outlined by each of the research areas just mentioned. We realize that modern historiographical studies venture into realms that have hitherto been unexplored, thus making it possible to better situate the development of historiography in the present context, including our presumptions concerning its future course. We are open to innovations, reserving, however, the right to judge their scholarly value and their usefulness to our journal. Klio polska. Studia i materiały z dziejów historiografii polskiej po II wojnie światowej. Redakcja naukowa Andrzej Wierzbicki, Warszawa 2004, s. 7.